Writing pads contain 50 sheets of 16 lb. 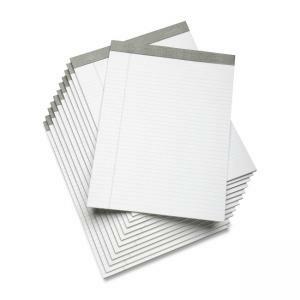 paper with 5/16" line spacings and letter-trim perforation at the top. Design also features a gray linen binder strip and 0.026 cal backer board. Each pad is made from 50 percent recovered material with 30 percent post-consumer recycled material and meets Executive Orders 13514 and 13423.